which change on day-to-day basis directly from the palm of your hand. "I am becoming more & more addictive user of the App with real time push notifications on credit/discount bills, I am able to use my time effectively with the convenience of anywhere anytime access of the store performance data. 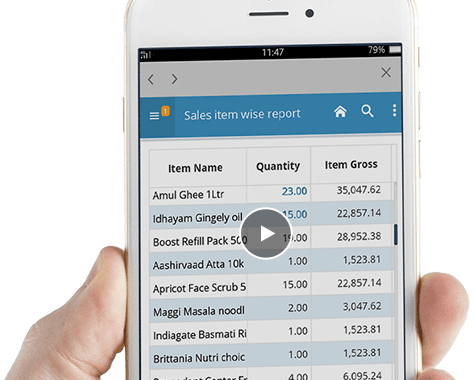 I always used to monitor store data the next business day but with WhatsNow I have real-time info, thanks to GOFRUGAL for the pleasant surprise"
I have GOFRUGAL POS and I want to get WhatsNow license, tell me how? Along with the GOFRUGAL POS you will get 1 WhatsNow license which is complimentary for one year from the date of purchase of POS. Once you have completed the 1st year complimentary WhatsNow usage you can renew it with subscription charges. What if I have missed renewing my WhatsNow subscription on time? How can I get WhatsNow App? Not to worry if you have missed renewing your WhatNow Subscription on time. You can renew it separately any time at a cost of /license.with appropriate subscription charges. Request for quote to know the pricing. No limit, any number of licenses can be purchased. What if I want to purchase additional licenses? Additional licenses can be purchased at a cost of /license. To know the price of additional licenses kindly request for quote. Can WhatsNow POS report app be connected to chain store outlets? Is Whatsnow supported for all of the GOFRUGAL products? Yes, WhatsNow is available for all products like RPOS7, RPOS6.5, DE6, HQ, ServQuick & TruePOS. Can WhatsNow App be connected with 3rd party POS application? What is the minimum OS version that supports WhatsNow App? How to integrate WhatsNow App to GOFRUGAL POS ? What benefits do I get from WhatsNow App? Make the right decision all the time with access to right information and more benefits. Change price from anywhere, anytime.